Not all that long ago, buying thermal or night vision optics for high-tech predator or varmint hunting usually meant settling for first-generation junk that couldn't distinguish a sheep from a coyote at 50 yards. Quality optics, assuming they were available for legal resale, carried such high prices that selling your truck and taking out a second mortgage was about the only way the average Joe could make a purchase. Times are changing — rapidly. Today's hunter who wants to plug pesky porkers or marauding coyotes while "owning the night" can find decent optics at prices about half or even less than they were just a few years ago. Match a thermal scope with a favorite rifle, add electronic callers and a comfortable means of setting up, and you're ready to rock the night away. Commercial feral hog hunting operations are increasingly popular throughout the South and Southwest. Price points are dropping on gear, and prospective shooters can watch hours of online videos showing just how successful you can be hunting these largely nocturnal critters when they feel most secure. If you're a hunter who might want to do this more than a couple times a year, investing in your own gear may make sense. This decision likely depends on expendable cash and access to places where predators and varmints prowl the night. Some hunting operations for deer and turkey also sport feral hog populations, and you just might be able to work in some nighttime shooting. That's what we did down at Great Southern Outdoors near Union Springs, Alabama, and at a number of coyote-plagued locations in Virginia. Two newer thermal scopes were used. At the lower end of the price spectrum, we matched a FLIR ThermoSight R-Series scope (RS32, 1.25-5x, 60Hz) with a Mossberg MVP Varmint rifle chambered in .223 Remington/5.56 NATO. 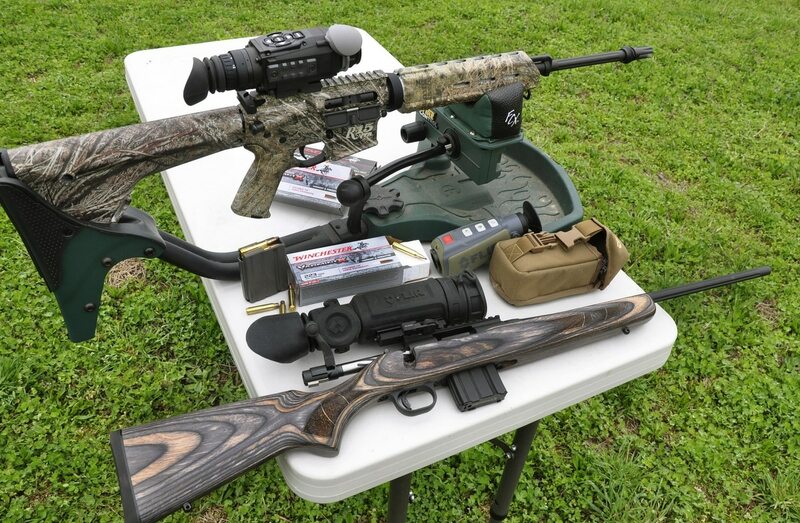 At the other end, we paired an ATN Corp. ThOR-640 scope (1.5-12x, 30Hz) with a Remington R-15 VTR Predator, an AR-styled rifle also in .223 Remington. Our Remington R-15 VTR (about $1,100) sported full Mossy Oak Brush camo, a two-stage trigger, and a fixed Magpul stock and grip. The Mossberg MVP Varmint (about $600) has a benchrest, pillar-bedded laminate stock, 24-inch medium bull barrel and user-adjustable trigger. The MVP rifle lineup accepts AR-style magazines. Thermal optics are like today's digital cameras in that the higher the resolution, the better the picture. The FLIR scope, with a suggested retail price of $3,999, had a focal array sensor of 336-by-256 VOx. It offered fine clarity out to about 80 yards. At 100 yards and beyond, the heat signature of a target such as a hog or coyote was readily apparent, but image sharpness tailed off. You could still smack down a varmint at longer distances, but precise bullet placement could be challenging the further out you get. FLIR has an excellent page on its website that shows the performance of the various R-Series scopes at distances of 50 to 300 yards. Thermal images using the ATN Thor 30mm. There are 10 color palettes you can choose from. Thermal image using the ATN ThR-640. There are 10 color palettes you can choose from. The ATN scope ($6,695) employed a 640-by-512 pixel sensor. As expected, its higher resolution enabled shooters to discern objects more clearly at greater distances. But, the ThOR scope was priced appreciably higher. Now, before you think, "Whoa, these are still high prices," consider that variable-power rifle scopes easily can run upwards of $2,000, and any decent thermal scope available just a few years ago was double the price of the current 640-by-512 sensor products. Similar to today's televisions, thermal scopes have "refresh" rates usually set at 30 or 60 hertz (cycles per second). That means a 60Hz thermal device refreshes the image 60 times per second versus 30 times per second for a 30Hz model. Unless your targets are moving frequently and at fairly high speed, this may or may not be that critical for night hunting. The FLIR unit had a 60Hz refresh rate compared to 30Hz in the ThOR. Magnification is nice, but each time you hit the magnifier button, you are degrading the resolution of the image. On units with lower resolution, anything above 2x magnification gets dicey in terms of target identification, especially at longer distances. The ThOR easily and quickly attached to the R-15 VTR's Picatinny rail. The FLIR units come with a LaRue Tactical mount. We had to swap out the Mossberg MVP Predator's Weaver-style rail for a Picatinny. This was easy to do, and some Mossberg MVP models do come equipped with the Picatinny. One thing to watch for when mounting optics to bolt-action rifles is the bolt jamming into the optic base when lifted. To enable full clearance and operability, we mounted the scope slightly farther back on the Mossberg's rail. Eye relief was still fine. The FLIR scope has a simple four-button design. The menu lets you adjust zoom in one click and all other settings in three clicks or less. The ATN scope, although slightly more complicated, was quickly mastered. Zeroing our thermal scopes took a little practice. We stapled chemical hand warmer packets to targets to provide a strong heat signature. It soon became apparent we were not going to be shooting for sub-minute-of-angle groups. Still, our 1.5- to 3-inch groups were easily close enough to enable reliable kills out to 100 yards. Completing our thermal package were a FLIR Scout II thermal night vision camera, a couple of Johnny Stewart electronic calls, Tenzing's new TZ PP15 Predator Pack. Constantly looking through the thermal scope mounted to the rifle can be very tiring. Plus, constant operation quickly consumes battery life. A FLIR Scout II thermal night vision camera, which is held like a monocular, was an excellent solution for keeping near-constant eyes on fields when the coyote calls were playing or in spotting and stalking feeding hogs in the dark. These units start at $1,999. We used a couple of Johnny Stewart electronic calls. For more prolonged setups, the more elaborate Johnny Stewart Bloodhound, which came with 50 preloaded calls and a wireless remote with a range out to 200 yards, was ideal. The big omni-directional speaker had rabbit squeals and coyote pup distress calls blasting across the farms. 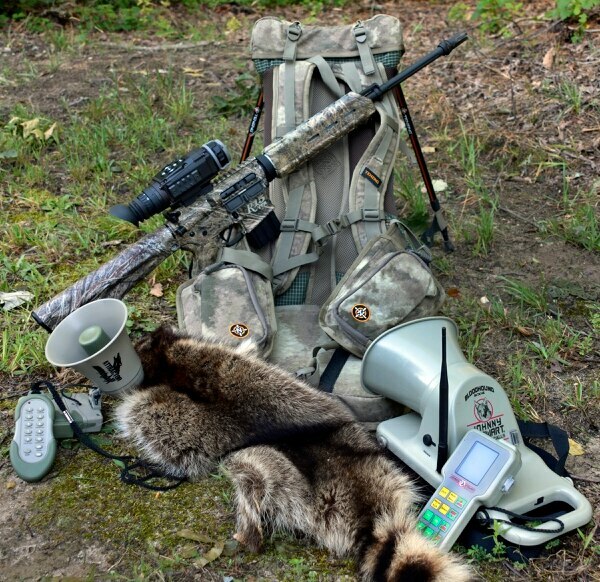 For closer quarters or running and gunning maneuvers, the smaller Attractor Max, with 10 preloaded go-to coyote calls and a wireless remote operating up to 50 yards, was the ticket. Carrying gear and ammo, and setting up comfortably and quietly, are critical to predator hunting. Tenzing's new TZ PP15 Predator Pack, weighing just 7.5 pounds, filled the bill. What makes this pack extremely versatile and reliable are the quick deploying, adjustable, spring-loaded legs and fold-down seat. You can set up anywhere. The pack has an internal aluminum frame with padded backrest, a rear daypack, detachable front pockets and removable electronics/camera case mounts. Totaled up, nearly 2,200 cubic inches of storage is spread across 23 inside pockets and compartments. Finally, delivering lead on target is the ultimate goal. Winchester Ammunition's Varmint X loads are designed for everything from prairie dogs to coyotes and bobcats. They're polymer-tipped, and the lead core has an alloy jacket engineered for fragmentation. While you're not necessarily hunting at long range at night, having ammunition that achieves rapid expansion helps with the task at hand — namely planting varmints where they stand. Varmint X loads for the .223 have 40- and 55-grain bullet options. Seasoned night warriors likely will have plenty of their own ideas about what's desirable for nocturnal predator and varmint hunting. One key consideration, especially if you plan on doing a lot of hog shooting, is looking at rifles chambered for bigger calibers. Many modern sporting rifles are now available in .308 Winchester. As you evaluate thermal optics, verify if they've been tested and rated for firearms at these higher calibers. You want the optic's sensitive electronics to withstand pounding recoil. Obviously, do some homework and check out new products and reviews. Personally examining and comparing units is the best option, if possible. Also, because thermal optics are expensive, look at the provided warranties and company track records of service. Finally, if you're serious about predator and varmint shooting, or you expect to be routinely protecting farms and ranches against these unwanted nighttime visitors, buy the highest resolution you can afford. Enhanced clarity and functionality, and corresponding opportunities for success, will be the reward. Ken Perrotte is a Military Times outdoors writer.